Metro boardmember John Fasana at this morning's Mobility on Demand launch in El Monte. Photo: Joe Linton/Streetsblog L.A. This morning Metro and Via kicked off a one-year Mobility on Demand pilot program. The kick-off event was held at the El Monte bus station. Speakers included Via Chief Revenue Officer Dillon Twombly, Metro boardmember John Fasana, and Metro Chief Innovation Officer Joshua Schank. Speakers emphasized the innovative nature of the pilot and how it can serve first/last mile needs for Metro riders. The pilot program is somewhat similar to ride-hail services, like Lyft or Uber, though with a few significant differences. It includes only shared rides and only for trips to or from three selected Metro Stations. It operates there from 6 a.m. to 8 p.m. weekdays. The pricing is set in advance. TAP card holders ride for $1.75 each. Non-TAP rides are $3.75 each. Riders enrolled in LIFE, Metro’s low-income fare program, ride for free. Metro On Demand is also “fully wheelchair accessible” according to Metro. Riders can use the Via app or arrange for rides using Via’s call center at (619) 731-0710. The three stations selected for the pilot are: Artesia, El Monte, and North Hollywood. The fixed-price fare is subsidized through a $3.4 million one-year budget, partially funded through a $1.35 million Federal Transit Administration (FTA) demonstration grant. The “Mobility on Demand” pilot is not Metro’s planned “MicroTransit” pilot, though Metro leaders have expressed that lessons learned from the current pilot could influence the latter. Though these sorts of MicroTransit/On Demand services are popular with transit agencies striving to better serve riders, so far their track record is not all that great. Recent SBUSA stories tell how on demand services are very costly compared to fixed-route bus service, while consistently serving fewer riders. On-demand drivers have, at best, delivered 2-4 trips per hour per driver – and some pilots achieved less than one passenger trip per vehicle service hour. Poorly performing suburban bus routes still deliver 10-15 trips per service hour. At best, these private partnerships have been performing similarly to dial-a-ride services, which have long been seen as costly. Once-promising MicroTransit pioneer Bridj recently closed down. Metro and Via are looking to fill a niche between full-priced private ride-hail and low-priced fixed transit ridership. 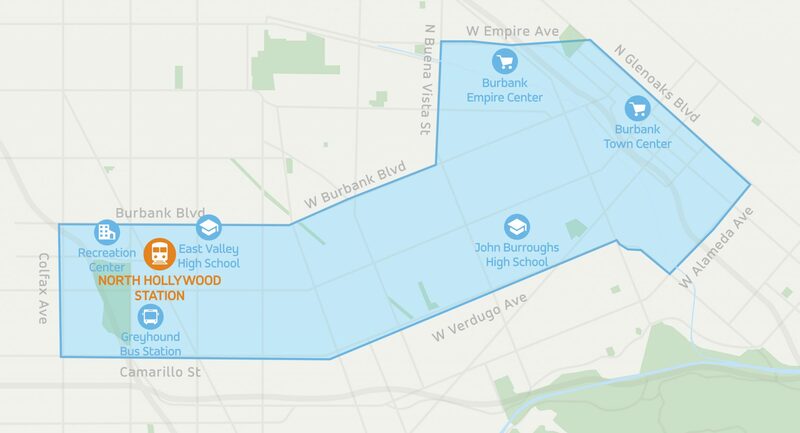 The Mobility on Demand pilot should show how all this plays out at three L.A. county locales and whether the costs can justify extending the service. Metro has an option to extend the pilot for a second year. Data should show how efficient on-demand pilot expenditures are and how they compare to other first/last mile strategies, such as feeder bus service, bike-share, etc. Streetsblog will continue to track this pilot and report how it does. I have to wonder if limiting it to three Metro stations will provide enough ridership to Via to make it viable. It seems like you’d get more useful data just full-on launching Via, while subsidizing rides that have one end at a Metro station. 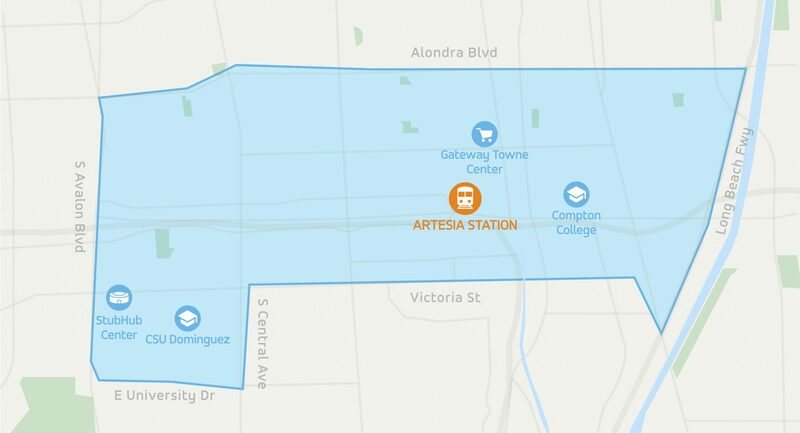 Isn’t the Artesia Station currently closed due to the Blue Line renovation? That may drive riders away from the station and thus not bring in good data points to see how well Via is using. 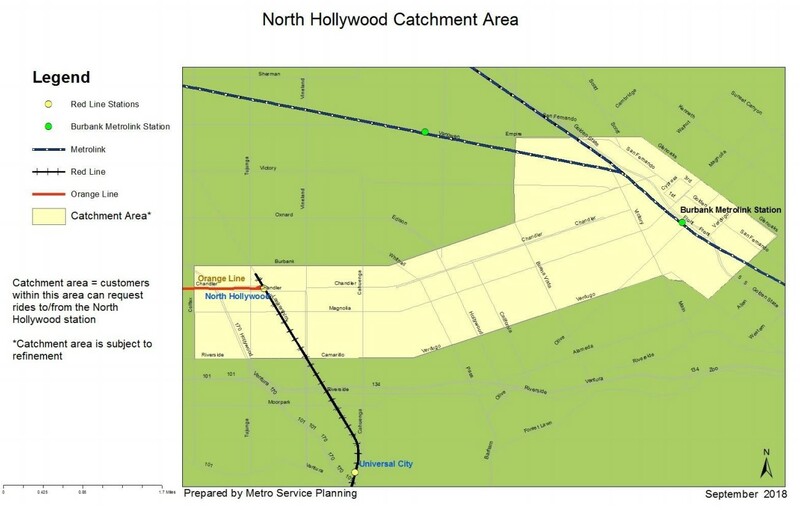 The North Hollywood/Burbank map left out the Burbank Metrolink station – is that just an oversight? If we just have adequate bike lanes and sidewalks micromobility would take care of itself. Everyone has bikes, ebikes, scooters, skates, etc to deal with this issue. I think assuming that the first/last mile problem has to be solved by a car is a bad idea. There was discussion at the Metro board as to whether the train station would be included – as it was initially just outside the boundary… I don’t know what was decided. I’ll ask Metro. I bike and that was more-or-less my thought when I see these maps: “I can just bring my bike and bike that easily.” I’ve biked from Artesia to Galaxy soccer games. The NoHo service area is basically centered on the Burbank-Chandler bike path. 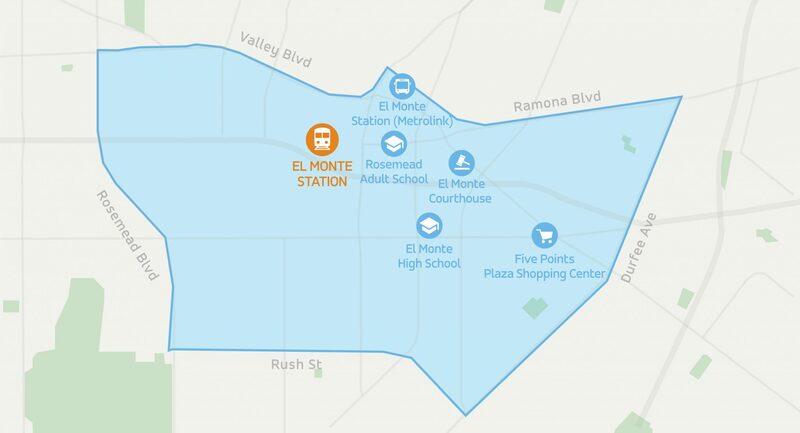 The El Monte service area is bisected by the Rio Hondo bike path. There’s a place for micro-transit. Not everyone has a bike or mobility device, and those of us who do don’t always want to use it. I think these modes can co-exist. Guest Opinion: Uber And Lyft, A Solution To L.A.’s First Last Mile Dilemma?